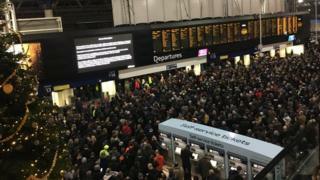 A trackside fire at London Waterloo has caused major disruption to journeys to and from the station. South Western Railway (SWR) said train services may be cancelled, delayed by up to 60 minutes or revised. Platforms 1 to 3 are out of use and disruption is expected until the end of the day, with SWR advising passengers not to travel on its services. It said the fire had affected track circuits on three lines that have come into contact with a 650-volt cable. Network Rail said the cable fire, which has caused damage to trackside equipment, was under investigation and it was working hard to reopen the platforms and return service to normal as soon as possible. The damage means each driver has to seek verbal approval before moving onto the next section of track, SWR said, which causes a backlog of trains. Trains between London Waterloo and Dorking will be cancelled. Trains between London Waterloo and Hampton Court will be cancelled. Trains between London Waterloo and Chessington South will be cancelled. Circular trains to/from London Waterloo via Teddington and Strawberry Hill will be cancelled. Trains between London Waterloo and Guildford will call additionally at New Malden and Raynes Park. All West of England services will start and terminate at Basingstoke. All mainline trains towards London Waterloo will terminate at Clapham Junction. Passengers have been told their SWR tickets are being accepted on alternative services. Rail tickets with Monday's date will also be valid on Tuesday. SWR has also been reminding passengers they are eligible for compensation if they are delayed by 15 minutes or more.